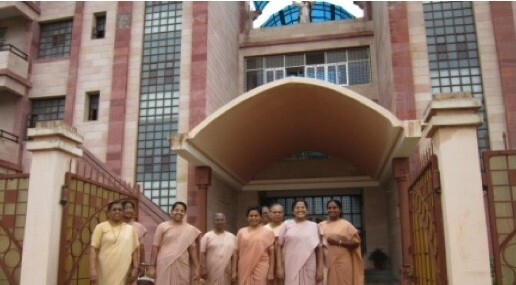 The Ursuline Mission in North India began on 28th June 1953, when Mother Stefania Murelli, the Superior of the Mission, arrived at Kanpur, UP, along with other Sisters. The invitation had come from the Bishop of Allahabad, Rt. Rev. Dr. L. Raymond who had given the Sisters a residence at St. Patrick’s Church compound. The Sisters began their healing ministry in a clinic situated in the heart of the town. Later, in December 1953, two of our Sisters began teaching in the Parish School, “St. Aloysius”. Mariampur School was the second House (1957), followed by the Mariampur Hospital which was inaugurated in 1961. Thereafter many other convents were opened in various parts of Utter Pradesh, Chandigarh, Chattisgarh and North East. The number of Communities kept increasing so fast, that it was found necessary to erect a Vice-Province for better administration and more effective service. The Nirmala Vice-Province was born in 2004, and was raised to a Province in 2010. At present there are 156 Sisters in the Northern Province, in 24 Communities, two of which are in Kenya (East Africa) The Provincialate is at Vimal Sadan, Lucknow.